Alright, y’all know me as being open to trying out new things and stepping out of my comfort zone every once in a while. Well, when I was given the opportunity to review this product I didn’t think I’d find it very useful. I am more or less a shampoo everyday kind of girl based on my hair type. My hair would just get greasy by the end of day 2 most of the time. And so, I wash it just about everyday. Being that it’s not greasy really until the end of day 2, I could get away with shampooing every other day though still. I just didn’t like the feeling of not washing it. It has also been said that shampooing everyday is not necessarily a good thing. In fact, feel free to look it up on the web about the no-shampoo movement. The theory behind it is that people who are and aren’t having trouble with the amount of grease in their hair are shampooing too much. The more you shampoo, the more active the oil glands are on your scalp so it produces more oil (which in turn leads to the amount of grease in hair). I’ve experienced a month or 2 of this cycle about 3 summers ago, but I kept on washing my hair every single day to keep it under control. In the winter though, it’s the same story for me every single year. My scalp gets dry and hair becomes more brittle. It is also time for the Holidays and that’s when I try to mix it up with my hairstyle. I would curl my hair for special events, but I do it rarely since it takes a lot of time to do it. In fact, I would wake up the next day and look at all the curls still intact and pretty. But I know as soon as I hit the shower, there is no way to save them. And this is where Save The Blow Dry comes in. So, is this something I would normally buy? No. But after trying it out, do I recommend it and will I get another in case something happens to the one I already have? Hell yes. Let me explain. First, it works very well. On a day I don’t want to get my hair wet because I have it curled or what not, I put this on and proceed as usual. I made sure I tucked all the hair under the cap. I was very apprehensive at first, thinking about skirting around the steady stream of water in the shower. Then I thought to myself how can I review this thoroughly unless I put it through every normal scenario I can think possible? So I just took my shower like I normally would, sometimes with the stream of water hitting directly where the top of my head is. I dried myself and hopped out to check the state of my hair. My hair is bone dry, either straight or with perfect curls cascading down my back. There were no spots on the cap for water to enter and ruin my hair. The inside of the cap is made of extremely soft micro weave towelling and the outer layer is completely waterproof. 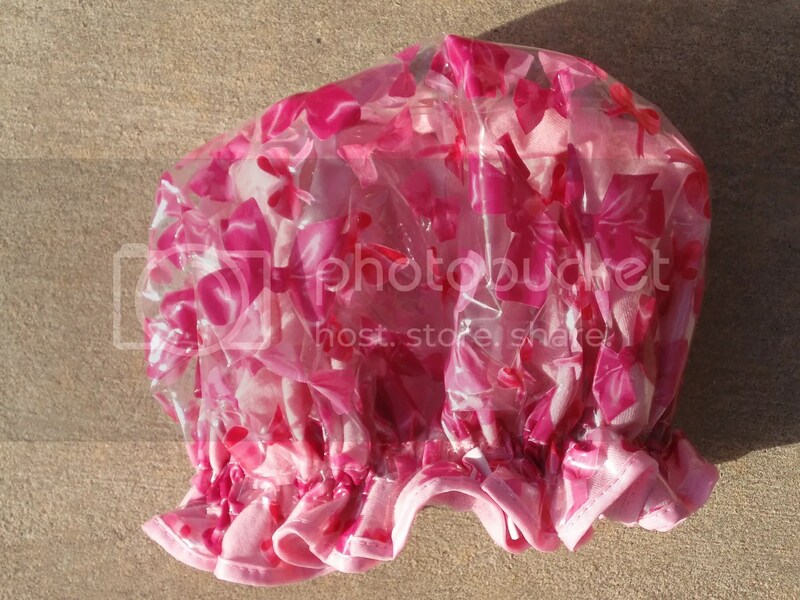 Looks to be made of very durable plastic material unlike the flimsy material most shower caps are made of. 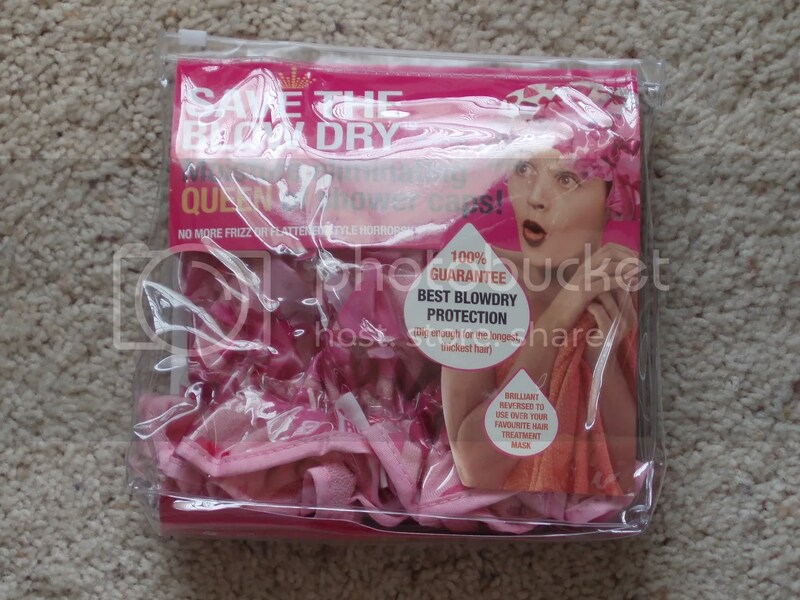 It is nothing compared to any shower cap I’ve ever used and that’s partly why I’m actually excited to be owning a shower cap for once. This is also extremely roomy that it holds all my hair in its curled glory. Let me tell you something: my hair is long. It was able to house my hair all curled (takes up more volume) with no problems. I actually like the pink color as well as the pink bows print on the cap. I’ve used this almost 10 times and my hair is dry and in the same state it was in before I tucked it into the cap. This retails for £14.95 each, but is on sale this month for £9.99! It’s available online here. While it’s not available locally in the US yet, this comes out to be roughly $16.50 before shipping. I personally think it’s worth it for a one-time fee on something that I actually want to keep and that works really well. Also, this is available in turquoise but it is limited edition. The print it features has blow dryers, brushes and combs on it. If you’re seriously considering getting this, I’d recommend getting it now while it’s on sale. I’ll say it again, in my opinion it’s worth the investment. This entry was posted on March 24, 2014 by kittypolishnbags. It was filed under hair accessories, Save The Blow Dry and was tagged with hair accessories, Save The Blow Dry.